With the number of individuals in need of assistance for chronic pain increasing each year, only a small fraction of patients with chronic pain are treated directly by the Pain Clinic. Numerous studies conducted in countries all over the world have shown chronic pain to be a prevalent and costly problem. The American Pain Foundation states that Americans get affected by pain more than diabetes, heart disease and cancer (American Pain Foundation). Another study suggests that the costs of healthcare for patients with chronic pain exceed the combined costs of treating patients with coronary artery disease, cancer and AIDS (Turk, 2002). The impact of chronic pain in the Northwest Region of Kaiser Permanente (a Health Maintenance Organisation in the Pacific Northwest, United States) has proven to be just as significant. Kaiser Permanente Northwest (KPNW) has identified 67,000 members with chronic pain. In 2003, the organisation did a survey of members with various chronic diseases and found that those with chronic pain showed the highest impairment and reported the most significant negative impact on their quality of life. Members with chronic pain are hospitalised more, make more emergency visits and outpatient visits than an average Kaiser Permanente member, even those with other chronic illnesses. In recognising the scope of the problem, in terms of prevalence, cost and human suffering, the KPNW Pain Management Clinic has created a programme to meet the needs of patients and care providers, all while keeping down costs of the overall organisation. Throughout the design and implementation of this pain programme, the KPNW Pain Management Clinic (PMC) has based its services on two facts of chronic pain care. The two facts are: 1) Research on chronic pain management has consistently demonstrated the need for a multidisciplinary approach for effective long-term results. 2) With the number of individuals needing assistance for chronic pain each year, only a small fraction of patients with chronic pain can be directly treated by the Pain Clinic. With these facts in mind, the KPNW Pain Management Clinic devised a programme that has consistently worked to accomplish two goals-to help members with chronic pain get their lives back and to help primary care providers treat members with chronic pain more effectively. As suggested earlier, the KPNW Pain Clinic firmly believes in the value of a multidisciplinary team. Starting with three anaesthesiologists working part time, one nurse, one clinical nurse specialist and one social worker in 2000, the programme has grown dramatically. A team composed of four anaesthesiologists, one physiatrist, two internal medicine physicians, a psychiatric nurse practitioner, four social workers, two clinical nurse specialists, three pharmacists, three advice nurses, two triage nurses, procedural nurses and medical assistants provide care. The team provides support to all services of the pain management programme. Services offered by the KPNW Pain Management Clinic consist of several interrelated components. 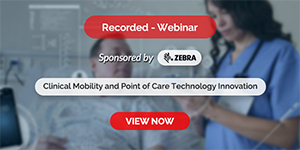 Each of these components works to meet the needs of the individual patient while providing assistance to the primary care provider responsible for ongoing management of the patient's overall care. All consultations performed by PMC providers include an accompanying chart note to the patient's primary care provider specifying recommendations or suggested services in order to enhance a team-oriented approach. The clinic's anaesthesiologists and physiatrist make recommendations and implement advanced pain management procedures from blocks to radio frequency procedures to implantation. The internal medicine physicians and pharmacists consult their patients and their primary care providers to either implement or recommend medication management plan for patients with complex medication needs. The clinic has one physical therapist that helps design treatment plans in collaboration with physical therapists throughout the KPNW system. Social workers, clinical nurse specialists and the psychiatric nurse practitioner consult Pain Clinic physicians or primary care providers for the management of patients with complex psychosocial needs and help develop treatment plans that optimise the resources and services of Kaiser Permanente. The clinic has three nurses devoted to patient advice. They answer patient questions, provide ongoing patient education by phone or email and assist in titration of medication. Two nurses triage more than 400 incoming referrals per month and ensure that the patients are directed to the service that best meets their needs. The clinic also has a partnership with a growing Integrative Medicine Program that consists of practitioners offering acupuncture, training in self-hypnosis, energy healing, ayurvedic medicine and neurostructural integration. For the sub-population of patients with both addictive disease and chronic pain, the clinic works closely with Addiction Medicine. At the core of the KPNW Pain Clinic are the multidisciplinary group visits that help patients learn how to manage their pain on a day-to-day basis. Forty series of eight structured group visits are available to members each year. These group visits help the primary care provider bring evidence-based pain management to members within their local area. 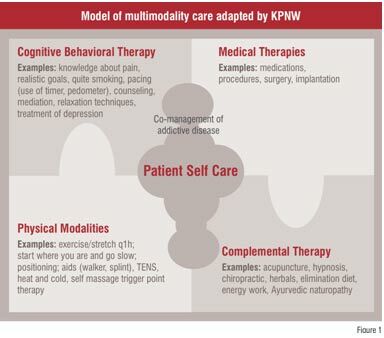 These visits help members try a variety of therapies in order to develop an effective individualised multimodal treatment plan (See Figure 1). The groups are also co-led by PMC nurses, social workers, clinical nurse specialists, pharmacists, the psychiatric nurse practitioner and the physical therapist. Because of the commitment to multidisciplinary care, all groups are co-led by a team composed of group leaders from two disciplines. Each of the first seven weeks presents new ways to manage chronic pain, emphasising the need for a multidisciplinary, multimodal approach. In the final eighth visit, a Pain Clinic practitioner and the patient work together to devise an individualised treatment plan. This plan serves as a guide for the patient and is also sent to the primary care provider as a way to enhance the working relationship between the patient and provider. While the PMC serves less than 10 per cent of patients with the most complex care needs, the primary care providers manage the majority of patients with chronic pain. In order to optimise chronic pain care to all individuals, the PMC is committed to help primary care providers, give more effective, evidence-based pain management care. To accomplish this goal, the staff of the PNC offers continuous education on pain management, consults individually via telephone or electronic messaging on questions of care, and provides tools and information to primary care providers. These tools are readily available to the primary care clinicians on their office computers. Every month at least one from the team consisting of physician, clinical nurse specialist, pharmacist, social worker or physical therapist is involved in educating practitioners through clinic in-services, department meetings or regional continuing medical education activities. The most effective education occurs on an individual basis through the discussion of care of patients dealing with complex bio-psychosocial needs. This communication is accomplished through e-mails via KPNW's electronic medical record; phone conversations and multidisciplinary patient care conferences. Consultations with the PMC staff regarding complex cases allow primary care providers to feel supported in their daily work and assist in the development of care strategies in future. US$ 1,000 per patient each year. Evaluation of five years indicates that this improvement in utilisation persists for many patients. It was hypothesised that this reduced utilisation occurred because patients improved their skills to deal with their pain and felt more confident about their ability to manage the pain and changes in the pain over time (Donovan, Jacobs and Blake, 2002). External pressures have often determined other outcomes that need to be considered. For instance, in both the states of Oregon and Washington (where KPNW provides care), it is required that all patients taking opioids for chronic pain have a signed consent and opiate therapy plan. The current method of producing list of patients who need this document produced and signed will soon be replaced by a reminder that is generated electronically in the medical record when an opiate therapy plan is required. With growing concern about the adverse effects of methadone and high dose opioids in general, pharmacy records are being reviewed to determine the outcomes related to these medications. As the demand for pain management has grown faster than resources to provide services needed, the waiting time for a patient from the date of his / her referral to consultation has become a critical outcome. The number of patients who complete the series of group visits is compared to that of patients who were initially appointed. In 2008, it has become clear that the cost of fuel is resulting in far fewer patients attending the group visits. The Pain Management team proposed developing a DVD of the pain management group visits that could be used with telephone coaching as an alternative to group visits when patients cannot afford to attend the group visits in person. Owing to the success of the PMC's services and the growing recognition of the need for aggressive pain management and the ageing of the population, the Pain Clinic has expanded to meet the growing needs of the KPNW population. Not only has the programme increased its staff by 500 per cent in eight years, but also the number of visits and their kinds has increased dramatically. 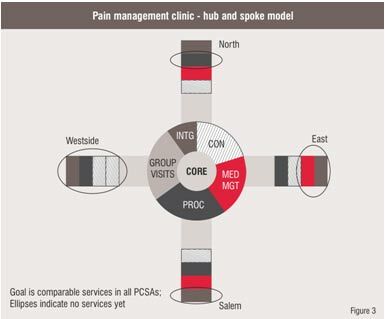 The KPNW Pain Management Clinic approach has many components that are transferable to other settings. The KPNW electronic medical record makes it easier to do the right thing, but it is not essential. The essential components are: a commitment to help the patient in becoming an active partner using multiple modalities of care each day; providing care as close as possible to the patient by supporting the primary care efforts; basing care on scientific evidence whenever possible; flexibility and ongoing development of the programme in response to internal and external needs; and patience and persistence-the energy to persevere because it is the right thing to do. Marilee Donovan has spent most of her career dedicated to improving pain management. She is co-founder and Regional Coordinator of the Kaiser Permanente Northwest Pain Management Program. Lindsay Kindler has been a Clinical Nurse Specialist with the KPNW Pain Management Program since 2004. She is also a doctoral student at the Oregon Health Sciences University. 2. Daut R.L., Cleeland, C.S., and Flanery R.C.(1983). 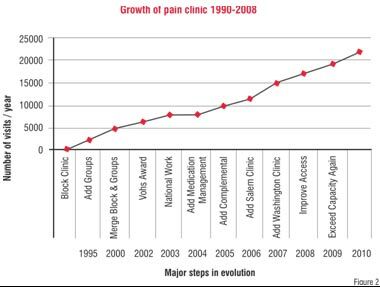 Development of the Wisconsin Brief Pain Inventory to assess pain in cancer and other diseases. Pain, 17, 197-210. 3. Donovan Marilee, Evers Kitty, Jacobs Paul, Mandelblatt Steve. (1999). When there is no benchmark: Designing a primary care based chronic pain management program from the scientific basis up. Journal of Pain & Symptom Manag, 18 (1):38-48. 4. Donovan Marilee, Jacobs Paul, Blake Martha. (2002). KPNW Integrated Pain Management Program. The Permanente Journal, 6(2):24-34. 5. Turk, D.C. (2002). Clinical effectiveness and cost-effectiveness of treatments for patients with chronic pain. The Clinical Journal of Pain, 18, 355-365.